Published: Oct. 10, 2013 at 08:30 p.m. Updated: Oct. 10, 2013 at 09:11 p.m.
New York Giants running back David Wilson should have been drafted by the Green Bay Packers, where there are no draconian castigations for the occasional fumble. Rookie Johnathan Franklin coughed the ball up again last week after fumbling away the Packers' victory at Cincinnati in Week 3. Running backs coach Alex Van Pelt has no plans to make an example out of Franklin, however. 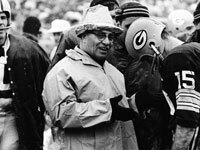 The career of legendary coach Vince Lombardi -- who directed the Green Bay Packers to five NFL championships in the 1960s -- will be chronicled on NFL Network on Tuesday, Dec. 24 at 9 p.m. ET. "I didn't say, 'Hey, you're done for the rest of the game because you put the ball on the ground,' because I don't think he's that guy," Van Pelt said Thursday, via ESPN.com. "If he's carrying it loosely and swinging it around and it's out all the time, then that's a different story, and you're not going to be out on the field, but I think he does take care of the ball." Imagine that, a coaching staff that works to instill confidence in a talented young tailback rather than sending him to the doghouse with an all-too-public bop on the nose. Whereas Van Pelt's primary goal is to win games and develop players, Giants coach Tom Coughlin has punished Wilson at the expense of his win-loss record. The same coach who excused Andre Brown's preseason fumble also brought back a washed-up renowned fumbler in Brandon Jacobs, while turning Wilson into a tentative runner. Young backs learn on the job. Walter Payton fumbled every 28.2 carries over his first three years in the league. Adrian Peterson's ball security woes were Internet and Twitter fodder throughout the 2010 season. Were they benched in the name of teaching a lesson? Of course not. Coughlin has shown a deft backfield touch in the past, but he could take a cue from Van Pelt on this issue. Coughlin's actions have had a direct impact on the Giants' devolution to the NFL's least effective ground attack.